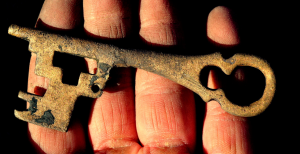 Many of you will have heard about one of the most recent and exciting archaeological discoveries in Dublin. Four adjoining house plots were excavated professionally on the south side of Dean Street, a short distance south-west of St Patrick’s Cathedral. 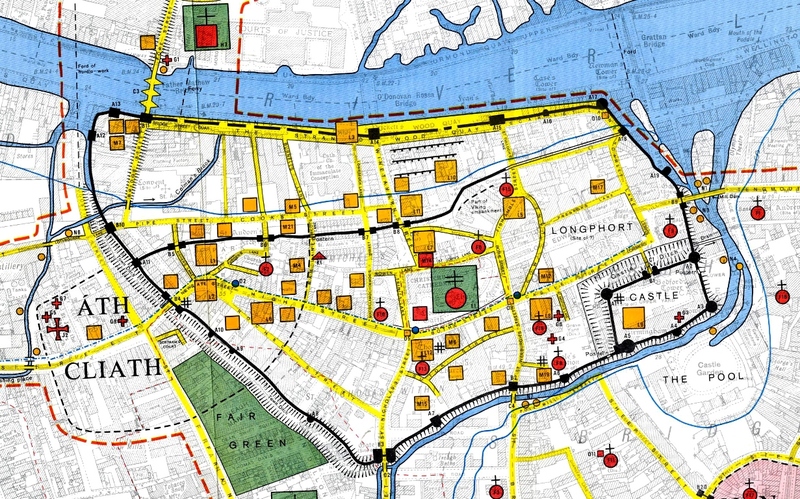 Like the cathedral itself, these houses were well outside the walled part of the city, but within the zone of archaeological potential identified back in the late 1970s on a large-scale map produced for the Friends of Medieval Dublin at the time of the Wood Quay controversy. The earliest levels are said to belong to the Hiberno-Norse period, which may be defined as c. 980 to c. 1170. The houses were made from post-and-wattle, like those discovered at Fishamble Street and elsewhere. One important aspect of this site is that it confirms that this type of so-called ‘Viking’ house continued to be built in Dublin in the early Anglo-Norman period before being replaced by more substantial timber-framed structures. The finds also demonstrate that Dublin was suburbanised at an early stage. The assembly site (Thingmount) and major burial mounds lay to the east of the main settlement, a number of Christian churches to the south and by the eleventh century a north-side suburb that eventually became known as Oxmantown. Dean Street is on the line of a pre-Viking long-distance highway (Irish slige) that led via present-day The Coombe and Cork Street towards the south-west of Ireland. The Coombe follows the course of a stream called the Commons Water in early times and it is no surprise that there are signs of industrial activity such as a tanning pit. 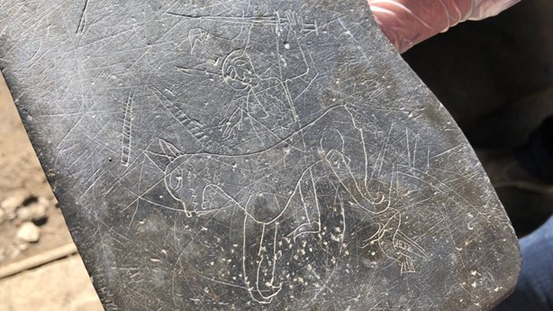 Among the small finds of medieval origin, the most spectacular are a rare example of graffiti art in the form of a horseman equipped with a sword and shield mounted on a horse, and a well–preserved copper alloy key. In addition there are significant amounts of pottery, floor-tiles, worked bone, wooden objects, leatherwork and much more. Some of the finds date from later in the Middle Ages, such as a well-made well and a merchant’s weighing-scales. The latest finds belong to the seventeenth to nineteenth centuries, demonstrating that post-medieval archaeology is important in its own way. For the Viking and Hiberno-Norse parts of the story of Dublin, an exciting new book is due to be published in mid-April. 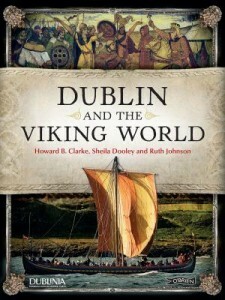 Its title is Dublin and the Viking World and the publisher is The O’Brien Press. A trio of authors – Howard Clarke, Sheila Dooley and Ruth Johnson – have aimed to produce an account that is focused primarily on Dublin, but which is located in the wider world of Vikings and their Hiberno-Norse descendants. The book contains about 170 illustrations, most of them in colour, depicting all aspects of living and dying in the Viking Age (c. 790 to c. 1100). This publication is sponsored by the visitor centre at Dublinia and is designed to appeal to the widest possible readership, both Irish and non-Irish. It is no exaggeration to say that such a detailed account of this kind will never be possible for any comparable Viking-Age site, since the combined archaeological and documentary evidence for Dublin is far superior to that for anywhere else in Europe. To learn more about Dublin in the Viking Age and later, make a note of the 20th Medieval Dublin Symposium organised by the Friends of Medieval Dublin. The date is Saturday 19 May 2018 and the venue the J.M. Synge Theatre in the Arts Building of Trinity College. Admission is free, all are welcome and further enlightenment is guaranteed. 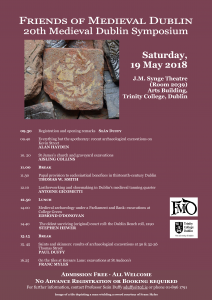 Professor Howard Clarke, now retired from University College Dublin (UCD), is one of Ireland’s foremost scholars on medieval Dublin, and has written extensively on this subject.